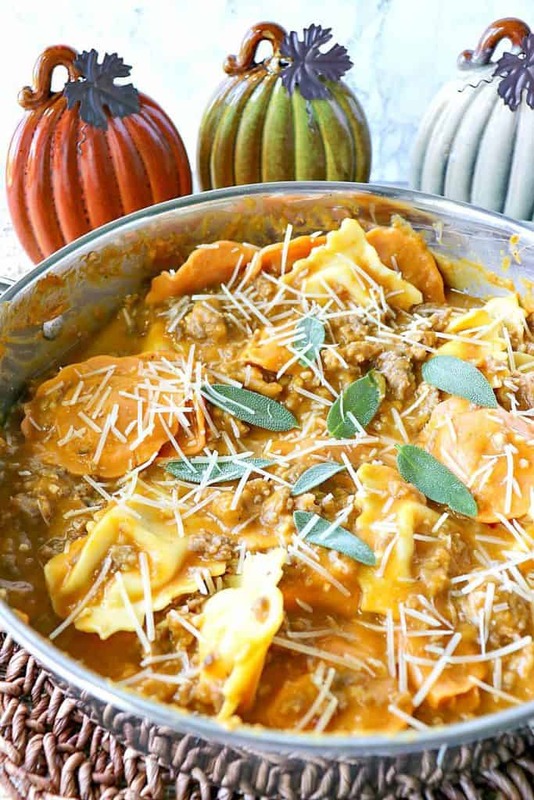 Easy Ravioli with Pumpkin Vodka Sauce & Sausage is proof positive that serving pumpkin for dinner is always a winner! Pumpkin recipes don’t always need to be sweet to be delicious, and the “proof” is in the pumpkin sausage vodka sauce. 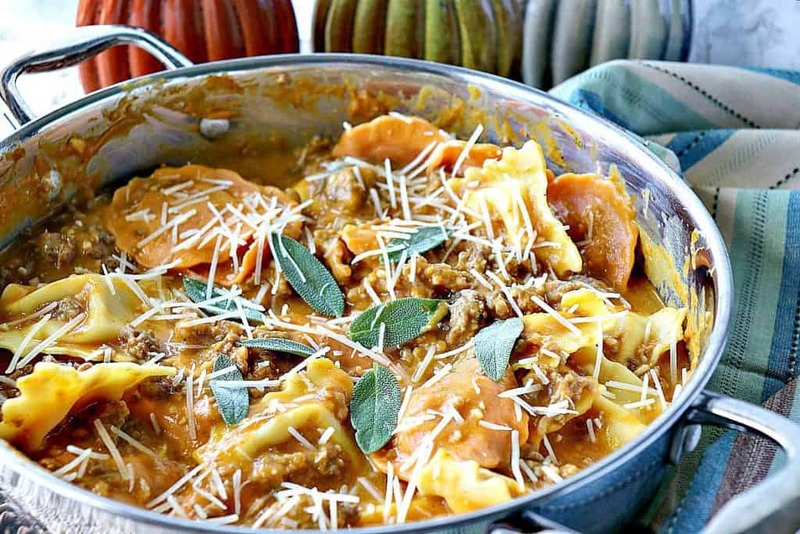 Easy Ravioli with Pumpkin Vodka Sauce & Sausage is hearty, savory, and full of the delightful colors and flavors of autumn. **Please Note – The printable recipe card with detailed instructions and complete ingredient measurements for making Easy Ravioli with Pumpkin Vodka Sauce & Sausage is available near the end of this post. Do I have to use vodka in the sauce? No! It’s completely optional. The flavor of vodka is minimal, and because the sauce is simmered after the vodka is added the alcohol content burns off so it’s definitely safe for the kiddos to eat. If you do decide not to use the vodka, add ¼ cup extra stock to the sauce to compensate. How long will this dish take from start to dinner? Less than 30 minutes, for sure. While the pasta water is boiling, brown the sausage. And while the ravioli is cooking, complete the sauce. Bring water and salt to a boil in a large pasta pot. While the water is coming to a boil, brown the sausage in a large skillet over medium-high heat. Reduce the heat to medium and add the canned pumpkin puree to the browned sausage along with the stock. Add the grated nutmeg into the pumpkin sausage sauce along with the Greek yogurt. Turn the heat off under the pan and add the vodka. Drain the ravioli, reserving approximately ½ cup of the pasta cooking water to thin the pumpkin sausage vodka sauce to your preferred consistency if desired. To serve, toss the drained ravioli into the pumpkin sausage vodka sauce, or spoon the sauce over the drained pasta. Garnish with fresh sage leaves (optional) and a liberal sprinkling of Parmesan cheese. With pumpkin season officially upon us, let’s celebrate this delightful and versatile winter squash just a little more, shall we? 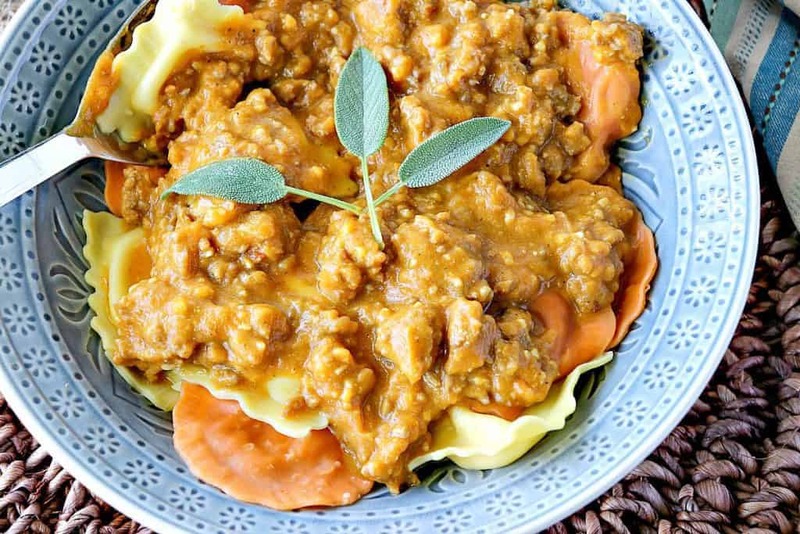 **The following affiliate links are some suggested products I’ve chosen that will aid you in the making and serving of this recipe for Easy Ravioli with Pumpkin Vodka Sauce & Sausage if needed. By clicking on the item photo, you’ll be taken directly to Amazon.com if you’re interested in purchasing any of these products. You are in no way required to do so, and you will not be charged in any way unless you decide to purchase one of these products through Amazon.com. As an Amazon Associate, I earn from qualifying purchases. Below is the printable recipe card for today’s Easy Ravioli with Pumpkin Sausage Vodka Sauce. If you’ve enjoyed this recipe and look forward to making it (or have already made it), I’d appreciate if you’d take a moment to give it some feedback by way of stars near the comment section at the end of this post. Thank you so much! Pumpkin recipes don't always need to be sweet to be delicious, and the "proof" is in the pumpkin sausage vodka sauce. 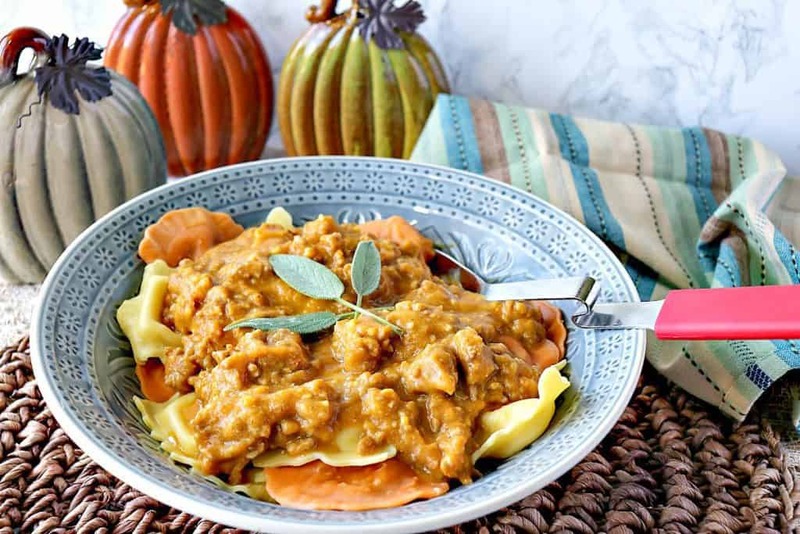 Easy Ravioli with Pumpkin Vodka Sauce & Sausage is hearty, savory, and full of the delightful colors and flavors of autumn. Reduce the heat to medium and add the canned pumpkin puree to the browned sausage along with the stock. Stir well. Add the grated nutmeg into the pumpkin sausage sauce along with the Greek yogurt. Stir well. Turn the heat off under the pan and add the vodka. Stir well and simmer. large pasta pot, large skillet, colander, ladle, wooden spoon, microplane (for the nutmeg, optional), measuring cups, measuring spoons, chef's knife, cutting board. This ravioli with pumpkin sausage vodka sauce freezes well. Package in an airtight container and freeze for up to 2 months. 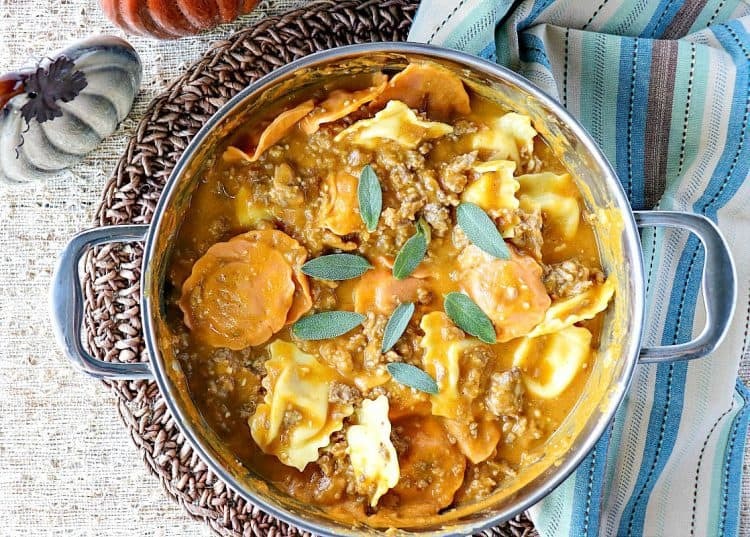 This will ravioli with pumpkin sausage vodka sauce will keep in the refrigerator for up to 5 days. I sincerely hope you’ve enjoyed today’s recipe for Easy Ravioli with Pumpkin Vodka Sauce & Sausage as much as I’ve enjoyed bringing it to you! 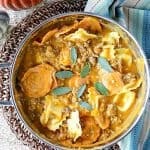 This is pure comfort food for fall! Delish! I think so too. Thanks, Christina!! This is seriously the most perfect October meal! It is delicious and great for serving to guests too! It would make a wonderful meal for company. It’s fancy but not fussy! Thanks, Nellie! This recipe sounds fantastic! I’m a pumpkin fanatic come fall and this sounds like something I could gobble down in a heartbeat. Saving this so I can make it later. Awesome! I know you’ll enjoy it, Linda! Thanks. Yum, this is absolutely everything! I love a good vodka sauce and this is perfect for the season. Adore. I adore pumpkin in savory dishes. I just made pumpkin enchiladas actually. This pasta is going on my must make list. I’m glad to hear it, Kristen. You’re going to love it! Holy Pumpkin, Renee! Great job bringing pumpkin recipes to a new high. Even at 8:30 a.m., your stellar photos have me drooling over my keyboard. This savory dinner truly looks epic. HaHaHa! I like to make people drool. Thanks, Dan!! Love it! Such a satisfying meal! I made this but eliminated the vodka. I liked it but felt it needed something…not sure what. I wasn’t getting a lot of pumpkin flavor and wondered about the Greek yogurt getting in the way of the pumpkin. If I did it again I would use more garlic and nutmeg and no yogurt. Definately easy and seasonal! Thank you for your comments, Erin. I find when you can’t quite put your finger on what a dish needs, it probably needs a touch more salt. Did you try that? Adding more garlic and nutmeg is never a bad thing. Go for it! From now on, I’m going to start writing my recipes saying “season to taste before serving” at the end.